It’s tiki time at Pagan Idol. Yelp photo by Amy M.
Back in October, there were rumors about a tiki bar coming to the Financial District, courtesy of the Future Bars team. 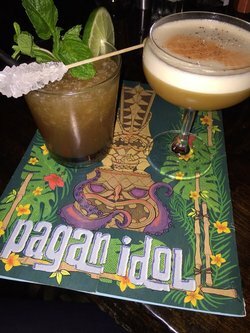 Cue the tropical breezes and smell of rum in the air: ~PAGAN IDOL~ is now open around the corner from their popular bar Rickhouse (you enter on Bush Street). There are two rooms: you can try to take a seat in the Captain’s Quarters, complete with aquariums and portholes, or sit in the larger room with tiki heads and a volcano burping smoke. Yes, really. Take your pick of well-executed umbrella drinks, and there are some large-format numbers too. You can read more in this Hoodline piece (and see some pics). Open Mon-Fri 4pm-close, Sat 6pm-close. 375 Bush St. at Kearny, 415-985-6375.